380 p., 17,8 x 24,5 cm. The mental roots of democracy were repeatedly sought in the theology of the Reformation, in particular in the ideas of the English Revolution, since it was here that the developments in religion and politics coincided. In regard to an equation of puritanism and liberty however, there seemed to be some serious doubts. 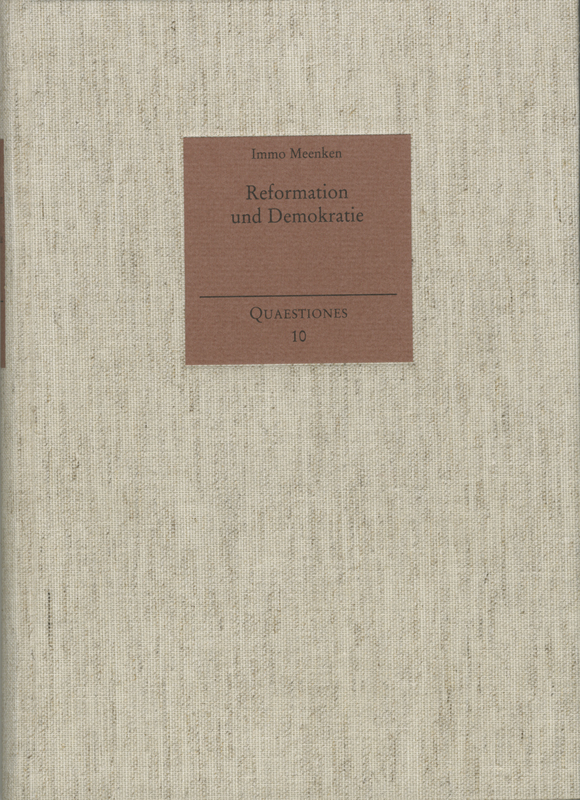 Thus the first part of the study questions the religious theories of the later stages of the Reformation systematically according to their democratic substance. The second part extensively incorporates Anglican theology into the array of problems for the first time and discovers vital aspects of democratic individual and social ethics developed in it which were generally lacking in Puritanism and the radical Reformation. Time and again the roots of modern democracy have been traced back to the Reformation. English history, in particular, seemed to furnish evidence, because Reformation and revolution took a rather simultaneous course in England. The view has much explanatory force, but also two obvious shortcomings. Firstly, it tends to overstress the analogy of Reformation and democracy by wilfully neglecting some inner limits of protestant theology. Secondly, from the beginning it focuses on the driving forces of the Reformation and cannot but esteem Anglicanism a hindrance of progress. This study aims at descibing the democratic impact of the English Reformation in a comprehensive and systematic manner. Its main topics are constituted by Anglicanism, Puritanism and the radical Reformation. Its analysing-levels are the institutions and the proceedings, the ideas and finally the values set up and practised by the various protestant confessions. To sum up, Puritanism and religious radicalism can be called democratic especially concerning their institutional system and procedure, that is to say, concerning church government. Theology and parish life of their churches have doubtless contributed a lot to forming a common consciousness and an empirical horizon proper to democratic progress. Nevertheless, Puritans and religious radicals were less democrats than revolutionaries always prepared to usurp theological reasoning. Basic concepts and values of their religious theories must be qualified as authoritarian, elitarian and intolerant. On the other hand, Anglicanism, as an episcopal system, was certainly not democratic. Yet some theologians of the established church managed to overcome such mental obstacles as named before. They could do so, because they shared a more positive view of man than their Puritan and radical colleagues who used to be obsessed by an overarching belief in hereditary sin and human frailty. Of course, faith still kept the central place in Anglican theology, too, but to some extent it made way for reason as a human quality. By consequence, the tension of searching the truth somewhat slackened. To be a christ in seventeenth-century Anglicanism had a practical meaning and signified more than to belief in a certain dogma. Anglican faith implied ideas of human dignity and human performance which, in turn, entailed a due respect to one’s fellow-man as a personal being in the above sense. Thus, contemporary Anglican thinking was featured by some fundamental individual and social values of modern democracy.